US, 1944, 130 minutes, Black and white. Frederic March, Alexis Smith, Alan Hale, Donald Crisp, John Carradine, C. Aubrey Smith, Walter Hampden, Percy Kilbride. The Adventures of Mark Twain is an entertaining biography of the famous author, Samuel Clemens, best known by his pen-name, taken from the boats on the Mississippi, Mark Twain. There is some dispute as to whether this is an accurate biography or rather some spinning of yarns in the vein of the author, along with some liberties taken with the dramatisation of his life and relationships. He is played with gusto by Frederic March. Alexis Smith is his wife. A strong group of character actors portray various personalities in his life, including John Carradine as the author Bret Harte. The film was released during World War II, also serving something as something of a morale-booster. 1. How much biography? How much portrait? Entertaining? A piece of Americana? 2. Warner Brothers style, black-and-white photography, use of studio sets, fantasy and memories? The musical score? 3. Audience knowledge of Samuel Clemens, of Mark Twain, his life, writings, his characters? His personality? His achievement and status? 4. The structure of the film: the prologue, Halley’s Comet? The early years, on the river, the affinity with characters like Huckleberry Finn and Tom Sawyer? 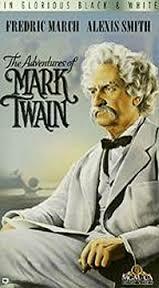 The old Mark Twain and his reminiscences, highlights of his life? 5. The South, its style, the 19th-century? The families? Slavery? Relationships between black and white? Samuel as a boy, growing up? His exasperation? The newspaper, the satiric touch? The river, the story, his becoming Mark Twain? 6. The river, the boat, Sam going away, the ship, steering? The captain and his experience? Moving through the fog and other manoeuvres? The portrait of the young Sam on the river? 7. Going to the west, the mines, the newspapers? The Civil War? The episode of the frog, the bets, the amplification of the story? The rivalry with Bret Harte? 8. Writing the story, its going to New York? The introduction of the joke? Talk and laughter? Success? The beginning of his writing career? 9. Courting Livy, the family, snobbery? The accident his staying? The marriage? The death of the child? Support over the years? His daughters? 10. His writings, the characters of Tom Sawyer and Huckleberry Finn? 11. The character of Livy, background, encounters with Sam, his courting her, the marriage, fidelity, her encouragement, continued support. 12. Samuel Clemens going to Oxford, the conferring of the degree, importance of the speech by the Vice Chancellor? 13. Steve Gillis, his friendship with Sam, a company into the West, jovial character? 14. The agent, his hard work for Clements, trying to discover the truth behind the publication of the story? 15. The publication and difficulties for the life of Ulysses Grant? 16. Mark Twain on tour, around the world, his performances and storytelling? 17. Bret Harte, writer, in the West, the frog competition, Sam Clemens’ bet, the rivalry? 18. The nature of the anecdotes, the dramatisation of history, not always accurate, but in the vein of Mark Twain’s yarns and storytelling?